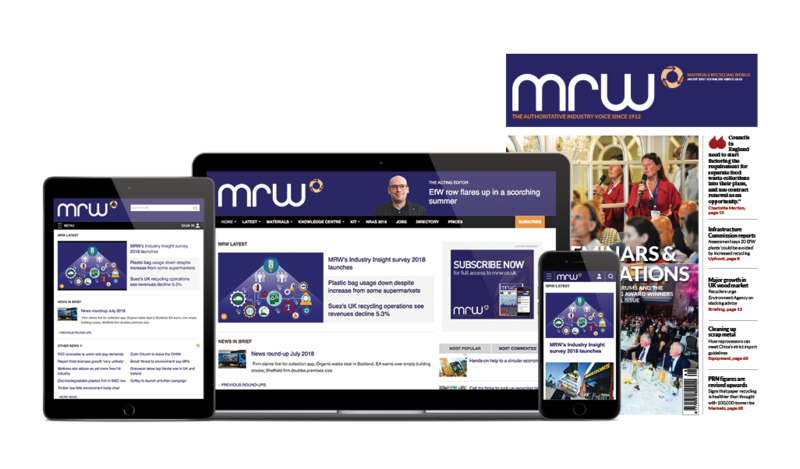 The organisers behind the RWM with CIWM show have published a market report on the sector, incorporating the views of leading players in the industry. The UK Resource Efficiency & Waste management Market Report has been compiled by i2i Events Group in collaboration with the Chartered Institution of Waste Management (CIWM) and other industry organisations. The report reprises findings of the UK Trade and Investment that waste management sector was expected to grow 3.1% in 2013-14 while recovery and recycling would see a 4% increase. It notes that specialist sectors such as electric and electronic waste recycling would see more growth than average. Financial incentives such as Landfill Tax, combined with competitive gate fees for different treatment options, have been instrumental in encouraging investment in higher stages of the waste hierarchy. Investment in renewable energy and alternative technologies has also increased, boosted by accelerated planning approvals. The study identifies some of the biggest opportunities in the waste management sector including development of innovative collection systems to preserve waste quality, and efficient treatment of residual waste as an energy source. Waste management firms will have to work together to develop new ways of doing business and meeting the demands of customers in the wider commercial, retail and industrial sectors, to take advantage of these opportunities, the report concludes. The study also examines the impact of European Directives on the development of waste policy in the UK. In the report, the CIWM urges the European Commission not to substantially change the 2020 targets in the various Directives because it recognises that businesses and public authorities have been planning for some time to deliver on these targets. “To move the goalposts now would undermine the business planning and investment,” the report says. The value of goods and services produced by the sector in 2010/11 was more than £12bn, according to the study. Delivery of shorter-term local authority contracts and contracts based on specific waste streams across municipal and commercial sectors.